I wish you a very sunny and relaxed Saturday mornin! A hot summer weekend started. One reason more to supply you with a hot summer story today. As announced on Billboard already on Monday, April 30th, the Billboard Hot 100 chart welcomes four new entries into its top 10: Ariana Grande debuts at No. 3 with her new single “No Tears Left to Cry,” while J. Cole notches an unprecedented trio of top-tier bows with “ATM” (No. 6), “Kevin’s Heart” (No. 8) and “KOD” (No. 10). 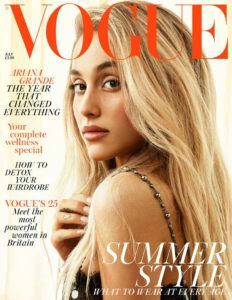 Finally Ariana Grande is the cover star of the July 2018 issue of British Vogue. 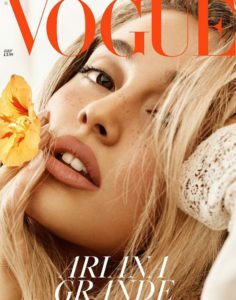 Photographed by Craig McDean and styled by Kate Phelan with hair by Chris Appleton and make-up by Mark Carrasquillo, Grande wears a Chanel autumn/winter 2018 lace dress with jewelled straps for her newVogue debut. And here’s her new hit ft. Nicki Minaj. Is she the favorite of our “BACKSTAGE” competition? Find out more in my next story! And here’ s the bonus track of today featuring another favorite. I wish you a hot summer Saturday, please stay connected!